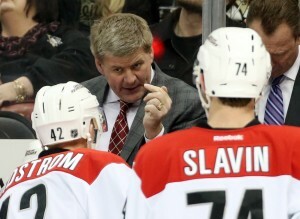 Bill Peters is a very busy man. The head coach of the Carolina Hurricanes just received a contract extension, has a preseason roster full of young talent to evaluate and groom into his system. But, in a few weeks, he will also be fitting the World Cup of Hockey into his schedule. Peters is in a good spot as a relatively new head coach in the NHL. Having established a solid record as a head coach in the Western Hockey League – winning the championship as the head coach of the Spokane Chiefs in 2008, and making the playoffs in 2009 and 2010 as head coach of the Rockford Icehogs. Peters’ first two years in the NHL have had positive momentum. Prior to joining Detroit’s staff, Peters served as head coach of Rockford of the American Hockey League (AHL), guiding the Ice Hogs to consecutive 40-win seasons and Calder Cup playoff appearances in 2008-09 and 2009-10. In his final season with Rockford in 2010-11, Peters directed the second-youngest team in the AHL to a 38-33-4-5 record. The Three Hills, Alb., native helped 28 Rockford players reach the NHL during his three seasons. Eight players who played under Peters for Rockford went on to win the Stanley Cup with Chicago in 2010 or 2013 – Niklas Hjalmarsson, Jordan Henry, Antti Niemi, Corey Crawford, Bryan Bickell, Nick Leddy, Brandon Bollig and Ben Smith. It is ironic that Peters’ final AHL team was filled with young players, a situation that he once again finds himself in as head coach of the Hurricanes. The fans in Raleigh, NC are hoping that he can lead his current roster of “young guns” to the playoffs, too. In the two years that Peters has been at the helm of the ‘Canes, the team has gone from one whose work ethic was often questioned, to one that has embraced their coach’s system of hard, fast hockey. Peters admits that they are still not where he would like for them to be, but they are moving in the right direction. Fans can expect the pace to be quicker this season, and the team overall to be faster. Mike Babcock, head coach of Team Canada in the upcoming World Cup tagged Peters to be an assistant coach. Also on the coaching staff will be Claude Julien, Barry Trotz, and Joel Quenneville. Canada’s slate of coaches is very impressive, and Peters knows he is in good company. At the Hurricanes’ press conference when his contract extension was announced, Peters said at lunch afterward that he will “definitely learn a lot” from being in close quarters with some of hockey’s best coaches. Peters said that his schedule was going to be filled with travel and meetings all the way up to the start of the World Cup. He said he will be doing a lot of scouting and working with the other coaches on strategy. Peters may not be on the bench as the said he will be “the eye in the sky” during games, but his input and what he takes away from the experience will be invaluable. Canada has 5 World Cup coaches, Bill Peters doesn't think they'll all be behind bench. "Too many bodies. There's a point of overkill." I asked Peters about how the crazy World Cup schedule would impact his ability to get his ‘Canes ready for the season, especially as it relates to evaluating talent right before the season. The games are scheduled to run from September 17 to October 1, meaning that Peters will be doing something other than running practices during the critical preseason. Peters said that he will be in very close contact with his own coaching staff, especially Rod Brind’Amour, Steve Smith and David Marcoux. He also noted that he will likely be back behind the Hurricanes’ bench for their fourth of seven preseason games, Sunday, October 2 in Minnesota versus the Wild. So Peters will make the World Cup fit into his schedule, and will bring back to his ‘Canes squad a wealth of information and experience that spending several weeks with some of hockey’s best coaches and players will give him. He is a coach that is coming into his own at the NHL level, and a blessing that Hurricanes fans in Raleigh need to appreciate and come out and support.